"Why is it that apologies for a militant Islam which stands for everything the liberal left is against come from the liberal left? Why will students hear a leftish postmodern theorist defend the exploitation of women in traditional cultures but not a crusty conservative don? After the American and British wars in Bosnia and Kosovo against Slobodan Milosevic's ethnic cleansers, why were men and women of the left denying the existence of Serb concentration camps? As important, why did a European Union that daily announces its commitment to the liberal principles of human rights and international law do nothing as crimes against humanity took place just over its borders? Why is Palestine a cause for the liberal left, but not China, Sudan, Zimbabwe, the Congo or North Korea? Why, even in the case of Palestine, can't those who say they support the Palestinian cause tell you what type of Palestine they would like to see? After the 9/11 attacks on New York and Washington why were you as likely to read that a sinister conspiracy of Jews controlled American or British foreign policy in a superior literary journal as in a neo-Nazi hate sheet? And why after the 7/7 attacks on London did leftish rather than right-wing newspapers run pieces excusing suicide bombers who were inspired by a psychopathic theology from the ultra-right?" "In short, why is the world upside down? In the past conservatives made excuses for fascism because they mistakenly saw it as a continuation of their democratic rightwing ideas. Now, overwhelmingly and every where, liberals and leftists are far more likely than conservatives to excuse fascistic governments and movements, with the exception of their native far-right parties. As long as local racists are white, they have no difficulty in opposing them in a manner that would have been recognisable to the traditional left. But give them a foreign far-right movement that is anti-Western and they treat it as at best a distraction and at worst an ally." Four years ago today, a tyrannical, murderous dictator was felled in Baghdad, after which three elections followed in the country of Iraq. However, the overthrow of the fascist, sadistic Hussein regime continues to drive liberal-minded people positively insane to the point where life in Baghdad under Saddam is romanticized. 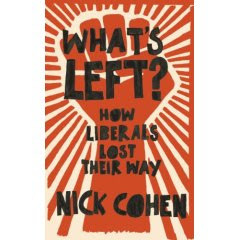 In this book, Nick Cohen, a British leftist whose bona fides include growing up in a home where neither Florida nor Israeli oranges were purchased (due to the sins of Richard Nixon and the state of Israel, respectively) finds the Left's excuses, apologies and near-embrace of all far-right anti-Western movements, up to and including al-Qaeda itself, unacceptable, unjustifiable and in fact, morally bankrupt. This is an absolutely essential tour de force which exposes the intellectual rot of the modern Left from within. Deliciously savage and brutally honest from one renegade thinker who is valiantly trying to reclaim his movement from those who regularly tolerate the most egregious of crimes as long as they aren't "imperialist".